With 20% more power than the VX2200, the RM-60 VHF Radio packs 60 watts of power for maximum performance and distance. 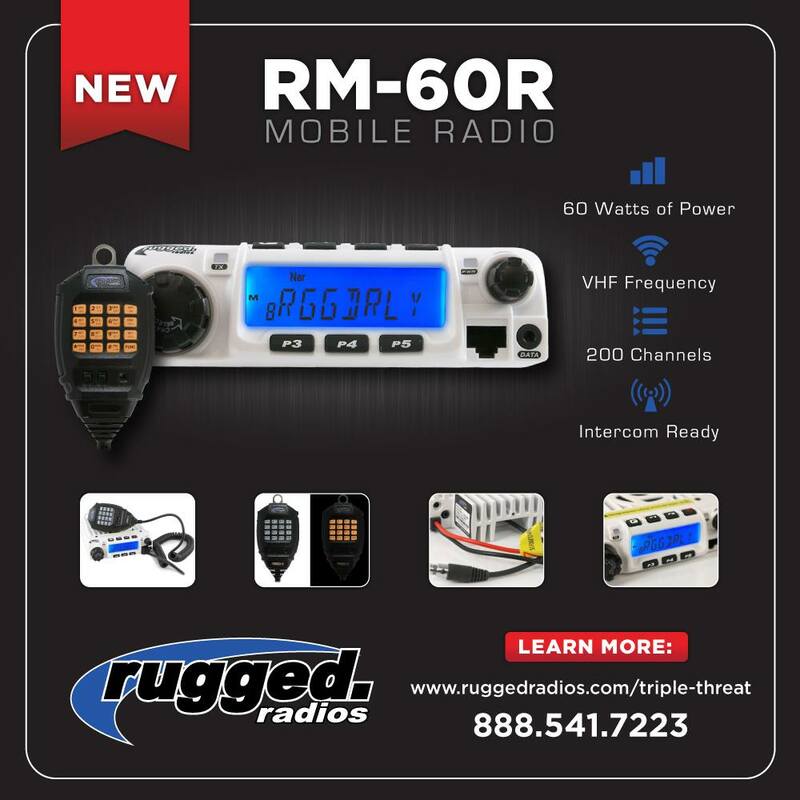 In addition to the long range capabilites, the RM-60 offers incredible features making it the new leader in VHF radio communications. Simple operation and an uncluttered face makes the RM-60 easy to operate. With 5 front facing programming buttons, the RM-60 is easy to program and adjust functions. The programmable hand mic allows additional programming and functions such as channel scanning, power level selection, squelch adjustment, keypad lock, scan skip, time-out-timer, and more. And, if you're riding at night, you can switch on the microphone backlight to illuminate the keypad. The RM-60 has more features than you'll probably ever need, but all these options are what makes the RM-60 such a strong and versatile 2-way mobile radio. Whether your prerunning the next desert race, or exploring the Dunes in Glamis, the new RM-60 Radio is the perfect choice to stay in contact with friends and family. Work, Race, Play... Rugged Radios is the Authority in Communications! Joyner trooper electric power steering for $200.. I made my own electric power steering for my Joyner trooper..I bought a steering column out of a 02 satern vue for $80 at a junk yard..then bought a wiring kit off of eBay for another $80. And made the steering arm...the wiring kit even came with a adjustable nob..
for those of you who havent been to our site yet, here is a look at our performance exhaust system. Made in house, certified for spark arrester, and db rated at below 94db. Legal for any race track, trail or off road park. Great sound without sounding like an open pipe as with some others out there. True bolt on kit.